Well, no. This is actually very refutable. I’m not going to examine the claim about tolerance, which is patently ridiculous, but Hoffman’s assertion that the US is the freest country on Earth is easily testable. However, just because the US ranks relatively highly on the global economic freedom continuum doesn’t mean that it’s the highest. America’s economic freedom is encouraging and something to be proud of, but it isn’t exceptional. 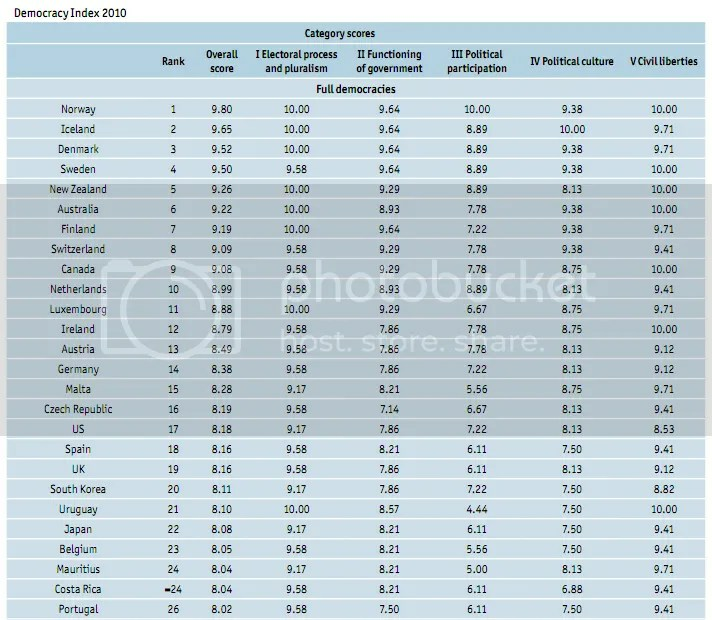 Again, the US ranks notably behind the European social democracies conservative Americans tend to dismiss as politically meritless. 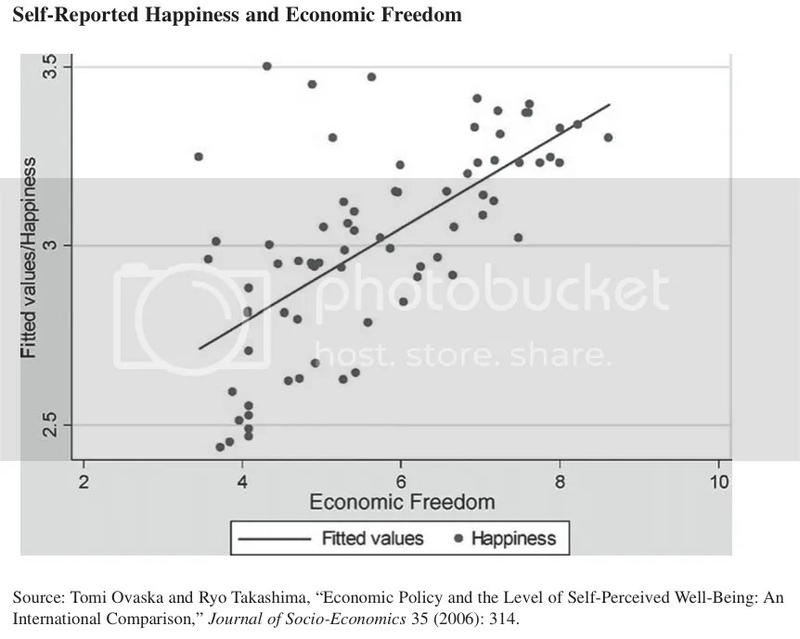 However, what I think is really interesting about the state of freedom in the US is how much less practical freedom Americans enjoy compared to nearly every other developed democracy. While economic and political freedoms are certainly important, the US’s clearly unreasonably high legal drinking age likely has a much more immediate effect on the practical welfare of young Americans. Similarly, the fact that the US government incarcerates 743 of its citizens for every 100,000 Americans (for comparison, the next large democracy on the list, Israel, incarcerates 325) means that a much larger portion of Americans have literally no personal freedom than citizens of other large democracies. Many aspects of US public policy, especially drug policy, directly result in lowering Americans practical freedoms, which is a fact many Americans, Hoffman included, seem unwilling to recognize. Of course, this isn’t entirely unexpected. Just like many modern Chinese nationalists seem unwilling to acknowledge that many of Mao Zedong’s policies directly resulted in mass starvation Americans would like to believe that their country is exception in areas that it really isn’t, because these selective views of reality lend themselves to narratives of national greatness. Human are social animals, and there’s good reason to believe that we are predisposed to employ many subconscious tricks to ensure that our interpretation of the reality we are presented with corresponds to our favored worldview. We’d like confirmation that America is exceptional in every way, so it’s common to refuse to internalize evidence that it isn’t. This is an extraordinarily common human cognitive bias, but we should be aware of how it affects our thinking. While modern America clearly grew out of a unique history, it’s silly and childish to blindly claim that it’s the freest and morst tolerant country in the world. America is a flawed society, and these flaws continue to inflict very real human costs. Refusing to recognize these faults is a recipe for only perpetuating them. I lol’d. You people take Gabby Hoffman seriously?